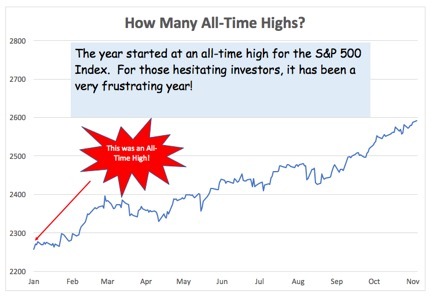 I have a simple question: How many All-Time highs has the stock market set this year? And for bonus points: Why does this matter? The financial “news” loves to speak of all-time highs as though they are a bad thing. There is always a drop in tone when market highs are mentioned such that one would think a drop in value must be coming next. However, just making it onto your television screen does not make someone an expert. In fact, the best way to get on TV is to have outlandish predictions and be able to hold your own under intense discussion. Being right is beside the point; it’s a ratings game, you see. Ahh, but what about our question? As of this writing, there have been 215 trading days this year. The first day of the year was, at the time, an all-time high in the S&P 500. Since then, the stock index has achieved 52 additional all-time highs. That’s 53 out of 215 meaning that about one out of every four days the stock market hit a new all-time high. All of these in the face of headwinds such as Brexit, more than the usual disarray in Washington, ongoing terrorist attacks around the world, <insert next “crisis” here>, etc. Since the beginning of the year, the market is up about 15 percent this year, meaning a strategy of waiting for a “better time” to invest has cost the hesitator 15 percent. No, that’s not exactly right, because that assumes she will buy today – and we both know she won’t. Instead, the hesitator is now likely even more convinced they are right. Even though the market has to drop 15 percent from here for their strategy to break even, she will likely continue to sit on the sidelines. We know of a better way. Use the markets in a way they have always provided value: have a long-term view using a wide diversification strategy with continuous, ongoing oversight of your positions. Oh, and sleep at night, too!